This is a much belated post about the wonderful treasures my mother brought back for me from her trip to New York. When my mom goes on her yearly sojourn to New York (yes, even mothers need vacations…especially mothers…especially MY mother) there are only two things I ask her to bring back: a box of chocolate truffles from La Maison du Chocolat and a bottle of Brunette from Le Pain Quotidien. I first tried Maison truffles when I was in Amsterdam and my cousin had just come from Paris with the beautiful brown box (doesn’t it look like leather?) in tow. It was love at first bite. We hoarded it greedily and savored each and every piece. When C came to visit we decided to spend a weekend in Paris and on the first morning, in a surprising stroke of serendipity, we stumbled upon one of their boutiques. Was that a breakfast to remember! Hot chocolate, pain au chocolat, and some truffles on the side for good measure. Criminal, I know, but I was in heaven! I bought two boxes of truffles for “take-away” and have been a convert ever since. 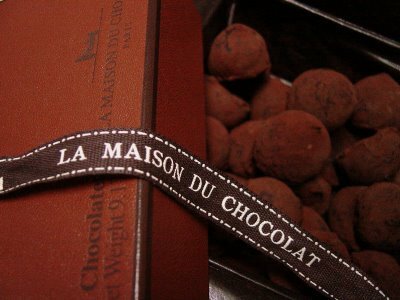 These truffles are divine and, to me at least, well worth the hefty price tag and any sort of trouble I go through to procure them. 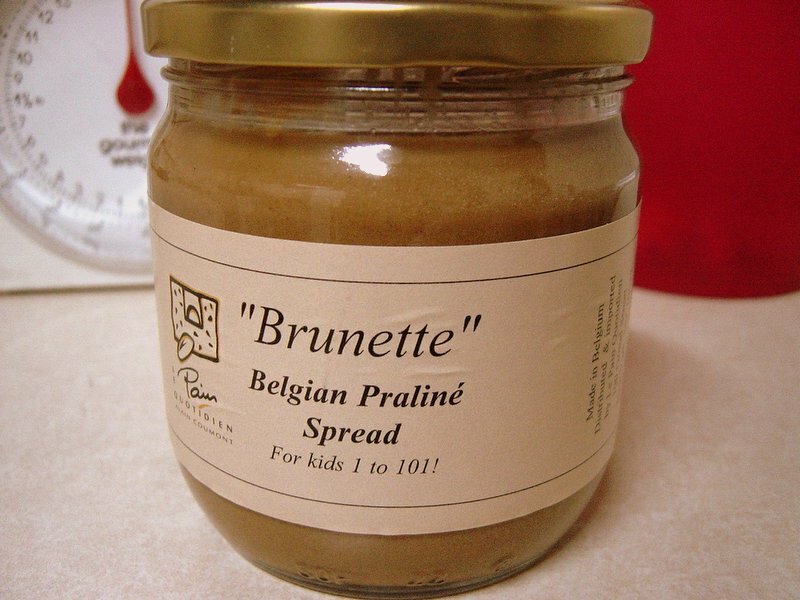 Brunette is a scrumptious hazelnut praline spread which is like Nutella without the chocolate, or peanut butter but with hazelnuts, or simply a little bit of spreadable nirvana. For kids from one to 101! Isn’t that great? That covers us all don’t you think? 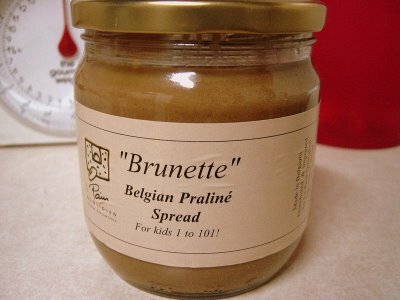 I have had it on bread, on cake, on a spoon, and even on Krispy Kremes (yikes!). Sweet hazelnut goodness…it spreads smooth, with just the tiniest bit of graininess so you know there are real hazelnuts in there. It is so rich that a little film of oil collects at the top if you leave it standing for a while…unlike the dry peanut butters I cannot abide by. Or am I just a sucker for all things calorific? Le Pain Quotidien originated in Belgium and, as the names connotes, started with its traditional bread, then expanded to include other goodies. It’s a great place to have breakfast, on their long communal, refectory-like tables. Order a basket of fresh bread and a cup of coffee and you have your pick of their delightful spreads and preserves in opened bottles, scattered on the table, with spoons already tucked invitingly inside. Not pictured here, but just as appreciated, were: a microplane zester (yey! ), French sea salt, The Arab Table by May Bsisu (it’s on the sidebar), a food mill, OXO non-stick flexible turners in rainbow colors, and a collection of spice mixes. « Breakfast # 8: Pancakes!